Depending on how you intend to travel with your pet both your requirements and those of the travel company can vary. However much you want your pet to travel with you on a plane journey it is not very likely that it is going to happen. The exceptions are assistance dogs such as guide dogs and then you will have to notify the airline when you book your own ticket. Dogs that weigh less than 10 kg can sometimes be taken on board but it depends on the airline. In truth you will have to book for your pet to travel in the hold of the plane. This is not as frightening as it sounds. The department at each airport that handles live cargo is both qualified and considerate when transporting all types of pets. The animal will travel in a crate that is the correct size for its weight. The animal will be able to turn around and settle comfortably without becoming too distressed. Not all airports have the facility for pets to travel under the Pet Passport Scheme and it may be that your much loved family friend will have a completely different journey to the rest of his family. You may be contemplating a trip across the channel, a longer trip to Spain or perhaps a quick jaunt to the Isle of Wight. Whatever trip you are planning if a pet is involved the plans will differ depending on the journey. For the Isle of Wight a Pet Passport is not required as the animal is not leaving the UK. However, the pet’s safety is still important to the ferry company and you will have to check to see if he is allowed to travel in your car or on the deck. If you have to leave the animal in the car make sure it is secure in a cage and cannot harm himself if he becomes distressed sue to the unusual noises and movement. For UK travel check with your railway provider before setting out as travel arrangements can differ. It may be that you will have to purchase a ticket for the pet but this does not mean that he can sit on a seat. Carry a blanket with you so the pet can sit in comfort. For pets that are not on a lead a cage will be required. When travelling overseas by train this will usually mean you have to travel via Euro tunnel. This will require your pet (if he is a cat, dog or ferret) to not only have a current Pet Passport but have his micro chip scanned by staff before he is allowed back into the UK. For other pets such as rabbits and hamsters a pet passport is not required as they do not walk on lead and are not likely to pick up such diseases as rabies or tapeworm infestations. If you need to hire a car for your journey, ensure that the seats are covered and will not be damaged by pet hairs. 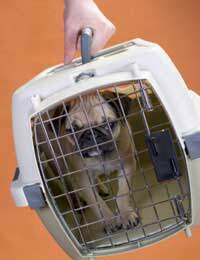 If possible ensure that a cage can be put into the back of the car so the pet can travel in comfort and safety.